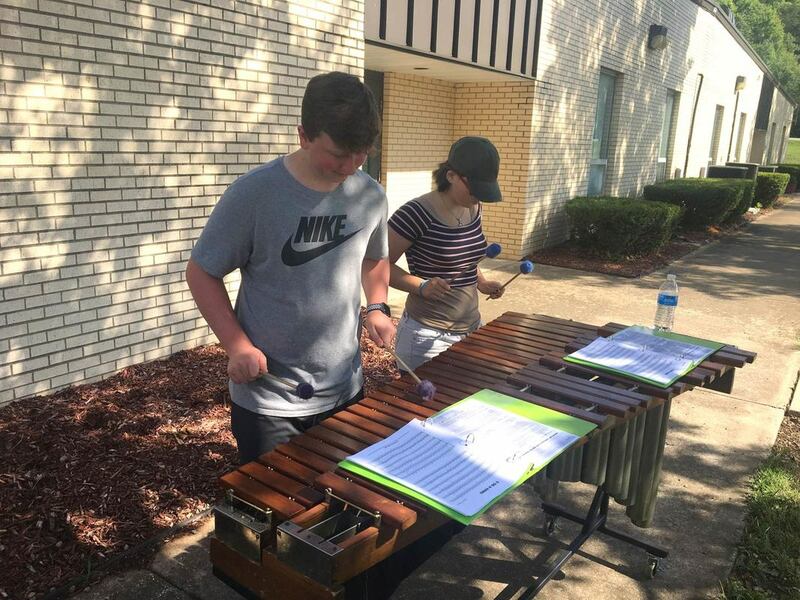 Colby Stacey (Left) and Alexis McClain (right) begin warmups on the marimba as the rest of the band begins their physical warmups on the field. It’s 8 a.m. on a hot July morning and while most students are in bed enjoying the summer out of school-students in the Pride of Galena High School Marching Band are on the practice field ready to begin a great season. Under the direction of Band Director Philip Thomas, the band began its first season of competitive field marching on July 16th with its first of week of music camp. Followed by a full week of on field and music rehearsal; Mr. Thomas says that students will complete more than 60 hours of ensemble rehearsal this summer-before the school year even starts. This is in preparation for a season of marching band competitions and festivals that will take place all over the state of Missouri that the band will play for this fall. Cat Kelley, a senior in the band, was ecstatic to be taking this step in the program. “It’s really great to see field marching in our school and to see it being done well. It’s great for our students to see that they are capable of great things. Field marching is a lot of hard work and it takes more time and even more dedication than before,” says Kelley. “For instance, recently we’ve have to repaint our practice field at the beginning of each week, which takes time and also money, but it’s an investment in our students’ futures that is well worth it.” Kelley also mentioned that with this addition of the field program, students are more prepared for college marching band as well as professional drum corps, which puts them in line for more scholarship opportunities for college, as well as chances for students to pursue music at a higher level. Follow the Pride of Galena HS Band on Instagram and Twitter at @GalenaMOBands to keep up with all the band’s endeavors throughout the year.